Culver Garden Court, Inc. is the 7th Garden Court constructed by Easterday Construction Co., Inc. We worked with Garden Court for over 7 years (and four Culver Town Managers) to find a suitable site for a project in Culver before coming to an agreement with a property owner on the south side of town. We are extremely proud of our association with Garden Court and were pleased to finally have the opportunity to place one in our home town! 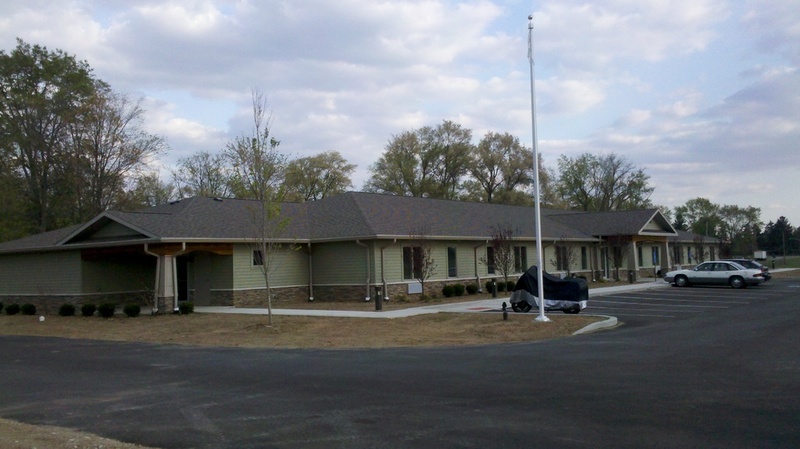 In order to make this project happen, we coordinated efforts between the Town of Culver, Garden Court and the property owner to negotiate an acceptable price, negotiate annexation of the property, negotiate acceptable rezoning and negotiate a water and sewer extension project to serve the property. Multiple presentations were made to the Culver Plan Commission, Culver BZA, Culver Kiwanis and Culver Chamber of Commerce as well as other civic organizations in order to garner support. In the end, this resulted in annexation of an additional 80 acres of property into the Town of Culver. The property was rezoned to R-2, in line with Culver’s Comprehensive Plan and a standing goal of opening up more property for affordable housing. The water and sewer project provides service not only to Culver Garden Court, but also for the first 30 acres of this annexation with the capacity to extend it to the remaining 50 acres. It has also helped generate discussion for a new Comprehensive Plan with infrastructure planning to encourage future development. Far reaching changes in order to get one project off the ground! Several changes to the Indiana Building Code resulted in changes making this project different from previous Garden Court projects. The new energy code changed framing and insulation. The heating systems for the units are heat-pumps in lieu of the gas-fired units previously used. It is also the first single story Garden Court to have a fire suppression sprinkler system. We also negotiated some additional “green building” techniques that reduced the amount of framing lumber used. Culver Garden Court also has the first Knox Box to be installed in Culver. Easterday Construction has played a role in helping Culver establish a Knox Box program and to promote it throughout the community. 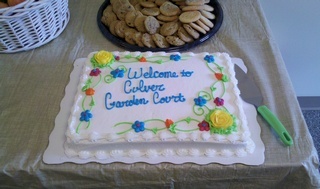 All the work resulted in Culver Garden Court, Inc., a 13 unit facility officially located at 801 South Main Street, Culver accepting the first residents the last week in February, 2012 with a ribbon cutting ceremony for the new facility on April 17th of 2012. 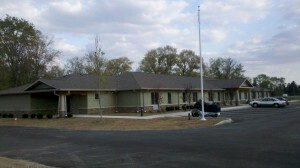 The planning and construction of this project was documented on our blog. You can see some pictures and read some progress reports regarding its construction at our blog on the menu bar above. Culver Garden Court blog entries can be found using a search on the blog page or by clicking here. Do you have a record of who installed the Blonder Tongue tv antenna in the attica of this building ? I believe that was installed as part of the security and communication package. Cottage Watchman did that installation and I believe that Garden Court has a security contract with them. Trying to find out if a booster was installed and what size it is. I did a quick look in the file and I don’t have that information. Unfortunately it’s been too long and too many projects ago for me to remember. I did confirm that the antenna was installed as part of the low voltage package with Cottage Watchman that included the nurse calls, security, etc. Garden Court should be able to contact them about any issues you’re having. thank you for the info you provided, it is very helpful. i will continue to search, as no one in the building is happy about tv problem.